Instead of the gap closing with Australia the neoliberal reforms led to a collapse on growth rates, slowing productivity growth, and a widening in the income gap with Australia and other OECD countries. 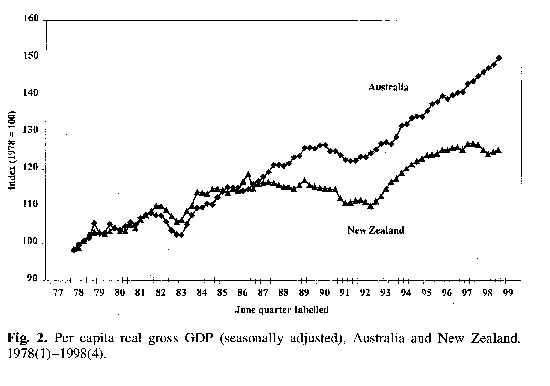 "Figure 2 [Graph 6 below] presents quarterly index data for Australia’s and New Zealand’s per capita real GDP (seasonally adjusted) from March 1978 to December 1998, with both series scaled to equal 100 for the calendar year 1978. The graphs show the two economies following a very similar growth path until the end of 1981. 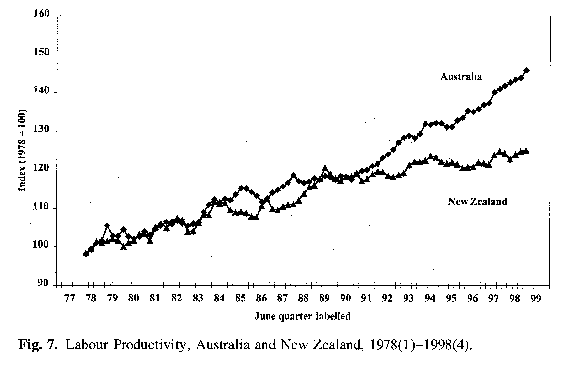 The world recession of 1982 then had a larger impact on Australia than New Zealand, but Australia had made up the lost ground by September 1985. New Zealand experienced a temporary two-quarter surge in GDP in 1986 (associated with the introduction of its indirect tax, the Goods & Services Tax, on 1 October); otherwise, the two series are again similar until June 1987, which marks the beginning of a widening divergence between the Australian and the New Zealand data…..
Dalziel also documents a similar divergence in labour productivity between New Zealand and Australia. Economic historian Brian Easton estimates that New Zealand’s GDP per capita as a percentage of the OECD average went from 98% in 1986 to 84% by 1993. Question 17: How did the tax and benefit changes in the 80s and 90s affect the incomes of wealthy individuals and corporations? The 1984-90 Labour government lowered the top corporate and personal tax rate from 66 cents in the dollar to 33 cents. A regressive consumption tax (GST) of first 10% then 12.5% on all goods and services was imposed which hits working people hardest. In 1981 24% of tax came from indirect sources. By 1991 it was 33%. Tax on business as a percentage of total taxation receipts went from 29.2% of the total in 1971 to 6.6% in 1990/91. The flattening of tax rates led to a transfer of wealth from middle to high incomes, while the regressive nature of the universal GST redistributed the tax burden to the poor. According to Victoria University lecturer in economics and public policy Rob Stephens, changes in the tax structures between 1982 and 1988 meant that effective average tax rates including GST for couples on average earnings with two dependents increased from 18.7 percent to 24.1 percent. Average tax rates for similar couples on three times the average income declined from 40.3 percent to 34.9 percent. The promise that wage earners would be compensated for the rise in consumption taxes and user charges by a cut in direct taxes proved to be a lie for most. Between March 1985 and March 1991 the average income tax rate for the bottom 20% of full time wage and salary earners increased from 15.7% to 18.3%, the middle 20% went from 25.1% to 23.6% while the top 20% went from 31.8% to 25%. It seems clear that for the big majority of wage and salary earners the tax changes would have made them worse off. Economist Brian Easton wrote that the 1988 tax reform reducing the top rate from 48 to 33% resulted in a “substantial increase in the incomes of those on high incomes. Typically those in the top tenth of income recipients were about 25 percent better off.” Easton calculated that in 1988 the top 10% of disposable household incomes (adjusted for size of household) averaged twice the average income. In 1991 they averaged 2.5 times the average largely due to the 1988 Douglas tax cuts. From 1984 to 1998 the top 10% of households increased income by 43% and the bottom 50% of households decreased income by 14%. A Statistics New Zealand report for the period 1982 to 1996 found that the gulf between rich and poor in New Zealand grew significantly. The wealthiest 10 percent of households increased their share of the country’s after-tax income from 20 percent in 1982 to 25 percent in 1996. The middle 70 percent of income earners share dropped from 71 percent to 66 percent. The bottom 20 percent never earned more than 9 percent of total income. “There was a substantial shift in New Zealand’s income distribution during the reform period. First, the lowest income deciles suffered a large loss of income during the depths of the recession in the early 1990s. 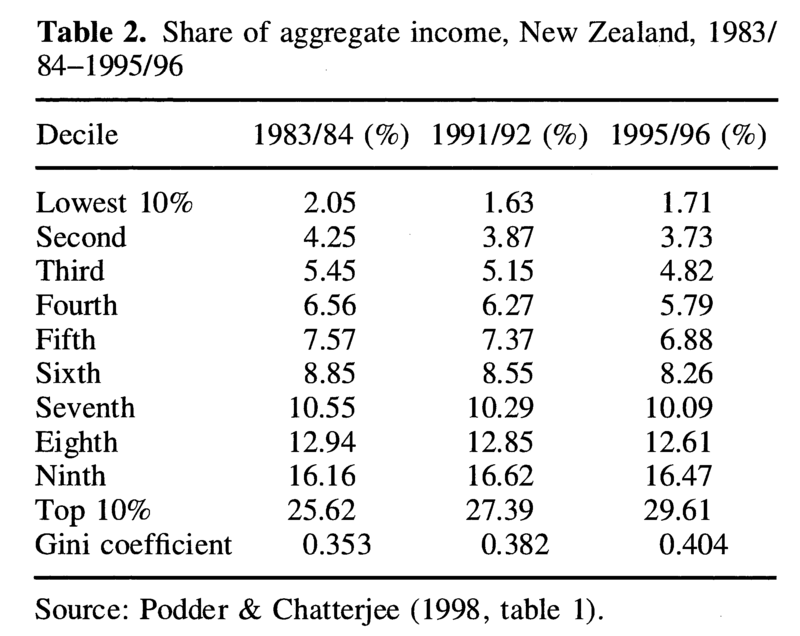 The average income of the lowest decile in 1991/92 was 21.6% lower than in 1983/84, and that of the second decile was 10.3% lower. These two groups shared in the post-1991/92 recovery, but by 1995/96 their average incomes were still 8.7% and 4% lower than in 1983/84. 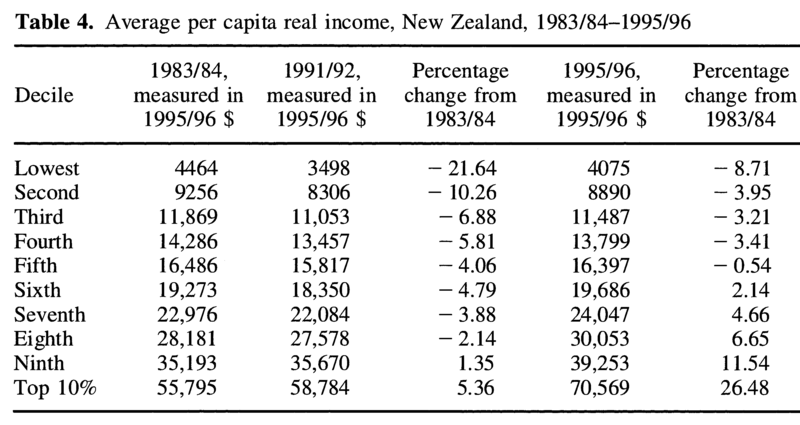 Secondly, half of the New Zealand distribution had lower real incomes in 1995/96 than before the start of the reforms, and for 40% of the distribution the loss of income was greater than 3%. These data support reports by a wide variety of community groups in New Zealand during the 1990s that poverty and social exclusion have caused widespread problems, particularly among low-income households with children (confirmed by Stephens et al., 2000, p. 31). Finally, Table 4 [ renamedTable 2 above – ed] shows that large gains were made at the top end of the income distribution during the recovery that peaked in 1995/96. Compared with 1983/84, the average income of the top 10% had increased by more than one-quarter (26.5%). In a democratic society we elect our politicians who, in turn, employ a bureaucracy of professionals to carry out their decisions. Things have happened recently that make me wonder about the line between those we employ as public servants and their accountabilities. I’ve written about the conduct of some sections of our police force and their legal advisers in terms of the Urewera raids and the Dotcom fiasco. This week, 21 gangsters got off because the police seemed to think the law didn’t apply to them. Mistakes are made, of course, but it’s the level of incompetency that should disturb us all. How did they not know that faking a prosecution against an undercover officer could turn pearshaped? The overreaction of the ninja uniforms terrorising the Urewera population, and the commando assault on an individual’s home, is one thing. But it’s the continuing dripfeed of basic systematic cluelessness on the part of our public servants, all the way to the top of the bureaucracy, that is alarming. We are constantly assured by our politicians that we need to pay our senior civil servants up to 10 times more than the average taxpayer earns because we need the best. We are told that we could pay them less when they had a job for life, but now they are treated like their private-sector colleagues who can be sacked at any time if they don’t perform. Really? 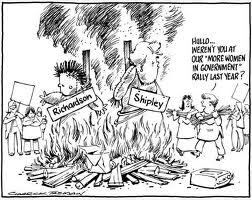 When was the last time we heard of a senior public servant getting the sack? Even when they retire with gold-plated pensions they still manage to get perk appointments. I don’t particularly mind them getting paid a lot of money if they are good at their job – they are workers after all – but what I do resent is they seem to feel they can do whatever they like and when they mess up nothing happens. The extreme example was the judge in the Christie Marceau case, who let the kidnapper out on bail about 300 metres from his victim. She and her parents were rightly terrified of this assailant and begged the judge not to release him. The cops stridently opposed bail. Even his mother said she thought he was a danger, and her daughter moved out of the family home through fear. With that background, I wonder how anyone could have granted bail. I’m told by friends who associate with judges that they really are an odd lot. They don’t mix with the rest of us because it may compromise their objectivity, which I think means they fear they may be compromised by association with the riff-raff. I kind of understand that reasoning but I can’t help thinking that makes them less in touch. I’m told that judges are under a lot of pressure, just like a surgeon in an emergency room, and mistakes will happen. This is nonsense on two levels. First, if health professionals make a mistake and someone dies there is an investigation and the culprits may lose their job and career. Here we have a situation where a judge is dealing with a violent kidnapping of a girl at knifepoint by a man who stripped and terrorised her. The victim, the victim’s family and the cops strongly opposed bail. I’m told the judge feels terrible and probably has had sleepless nights. Poor thing. What about the parents who, I bet, have had sleepless nights every night since her death? In the private sector, does anyone doubt that an employee who ignored all advice and made a contrary decision that led to the death of someone would not have been sacked? Our senior public servants get paid oodles of money, they receive all the trappings of power, but it looks to me like there are no consequences no matter how incompetent they are, and then they retire with benefits that the rest of us can only dream about. We blather on about one law for all when it comes to race, but it’s clearly another set of rules when it comes to our senior public servants. Support the IUF campaign to defend Coke workers in the Philippines. Is this email not displaying correctly? 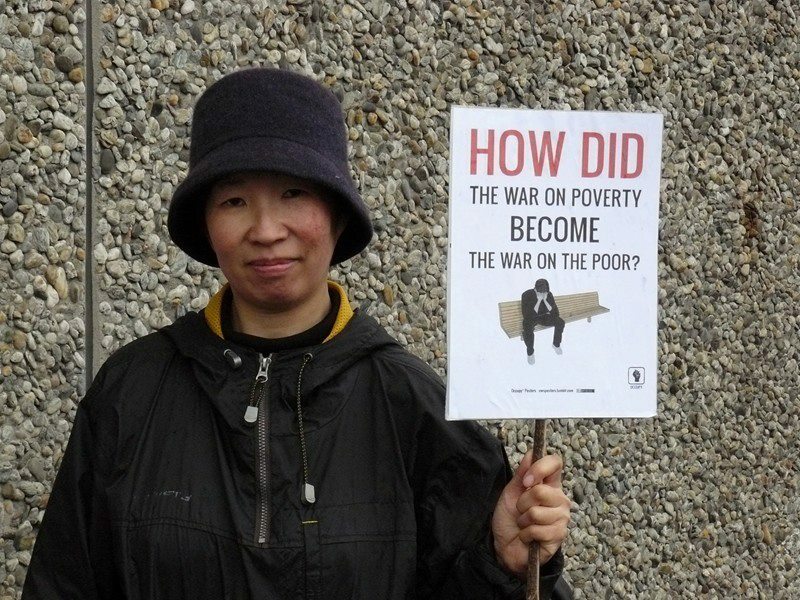 This week we’re passing on urgent action appeals from the Philippines and Korea, an update on a worsening situation in Zimbabwe, and a chance to help get $87,000 for your favorite union or website that campaigns for workers’ rights. Coca-Cola in the Philippines has replaced collective bargaining over wages with arbitrary individual wage increases as part of a broader assault on workers’ rights. Unions representing Coke workers there have taken to the streets in protest. The IUF has launched a global campaign to back these workers – to learn more or to show your support, click here. ING, the Netherlands-based bank, has been restructuring and the result in Korea has been a strike lasting more than two months. The company is refusing to consult with its workers and UNI global union, which represents workers in the banking sector, has launched a global campaign to pressure ING. To learn more and to support the campaign, click here. Meanwhile in Zimbabwe, a member of the Executive Committee of the newly-formed IndustriALL global union, Angeline Chitambo, has been dismissed from her job and this follows the sacking of 135 workers by the Zimbabwe Electricity Supply Company (ZESA) in July 2012. Full details about this latest attack on the union can be found on the IndustriALL site. If you’ve not yet done so, please send your message of support to the Zimbabwe Electricity Workers Union (ZEWU) here. Finally, we’re very pleased to once again pass on the news about the Arthur Svensson International Prize for Trade Union Rights, which was established by the union Industri Energi (in Norway) in 2010. In its first three years, the prize has been granted to Wellington Chibebe, Secretary General of the Zimbabwe Congress of Trade Unions (ZCTU), Shaer Sae’d, Secretary General of the Palestinian General Federation of Trade Unions (PGFTU) and the C.CAWDU (Coalition of Cambodian Apparel Workers Democratic Union). The prize will be granted annually to a worthy winner, based on proposals from trade unions around the world. The prize money is NOK 500,000 (approximately $US 87,000). The deadline for the 2013 nominations is 31 January 2013. Nominations can be made in Norwegian, English, French or Spanish espen.loken. Copyright © 2012 LabourStart, All rights reserved. I was confused when I couldn’t find his shop doorway and had to pace backwards and forwards to try to find the signage. It took a few seconds to dawn on me that part of my history had been replaced by a papered-over front window. I’d known my retailer and his family for almost three decades. I used to be a daily customer and even after I moved out of the area I managed to drop in regularly. My guy never failed to greet me and other customers by our first names. He was always relentlessly positive and you never left his store without feeling your spirit had lifted. He knew all his products and if he didn’t have something, he’d offer to order it. A few years ago one of those box retail chain stores opened down the street. Initially, little changed but in recent times I noticed gaps in his shelves. The last time I saw him his cheerfulness was strained and his smile fixed. On the brink of tears he told me he couldn’t compete with the chain store and his mounting debts had caught up with him. I hoped he’d be able to continue to eke out a living. We know abstractly that in our capitalist economic system it’s the natural order of things that big corporations eat smaller businesses to grow bigger still. When we see the human cost it’s difficult to be so philosophical. It was cruel irony on Friday that I read a glowing article in the Business Herald on the hundreds of jobs being created in a new Warehouse and a couple of supermarkets in Silverdale on Auckland’s North Shore. I could feel the pride of new employees who were so enthusiastic and grateful for a chance to earn a living with a big employer. It may not be full time and the workers may have to give up their evenings and weekends, but it’s the price for having the dignity of work. I wasn’t sure if the writer was being sarcastic when he mentioned a 17-year-old young woman was “happily” doing a 50km round trip each day to get to work. Given it would cost her more than $100 a week from her after-tax minimum wage, she’s certainly a trooper. What wasn’t said, of course, was that opponents of these giant national retailers claim that for every job they create, one-and-a-half existing jobs are lost as they squeeze smaller retailers out of business and use their dominance to reduce the margins of their suppliers, who also shed staff to stay operating. Just about every small town has lost its battle with The Warehouse. It’s hard to resist the lure of cheaper prices of goods from countries such as China. Trading our local small community business owners who know us with faceless staff in the same corporate uniforms, trained to say and act in the exact same way, is one thing. But now it seems these corporates are moving to the next level of reducing costs and maximising profit. Have you noticed how The Warehouse and supermarkets now expect us to check out and pack our own goods? If we insist on a checkout operator, do you notice the fewer stations and longer waits? Eventually, the only human we’ll see is a security guard making sure we don’t pinch anything. After using a convenient free carpark, I sat in the comfort of my air-conditioned mall where it never rains or is windy, musing over the fate of my former shopkeeper. For good reason we should blame faceless corporations and the Stephen Tindalls of this world for destroying our way of life. But we bear some of the responsibility by accepting the demise of our local communities, where everyone knows our names. We have traded it for the impersonal but convenient shopping malls and sheds where no one even cares to ask. Question 16: Why do big business and the government want to cut welfare spending? By targeting the most vulnerable the government hopes to get support for large scale cuts to basic welfare for everyone. They can then use those cuts to finance tax cuts for business and the rich. And they are happy to lie to achieve that goal. John Key claimed in February that the government would save $10 million over their lifetime if 100 sole parent beneficiaries were moved off benefits and into work. In March he upped the ante and claimed that getting 5 percent of DPB recipients (around 2150 sole parents) with a child over six off the benefit would save $200 million. This calculation assumed the full cost of DPB over another 6.5 years on the DPB. This number doesn’t actually match time usually spent on the DPB. What he also “forgot” is that nearly exactly the same amount would be spent or lost on Working For Families, In work Tax benefits, child care subsidies, payments from the other parent (which goes to the State) and the like if (as can be assumed) they work 20 or more hours a week. Working for Families alone would cost $170 million over the 6.5 years. That’s the way our benefit/wage/tax system is set up. The biggest disincentive to working is the 100% marginal tax rates for income earned by beneficiaries over $80 a week. The proposed increase in this level to $100 (for those on the DPB and invalids benefits only) will do very little remove the real disincentives that exist to working more hours while transitioning off a benefit. This $20 increase is the first increase in the limit in two decades!